Our first labels were a much bigger battle than they needed to be. I think that new businesses have these situations where everyone has an opinion and is trying to define the future of the company in one step. I think my first version of the label set the tone for our approach but style is often an organic thing that grows with the people putting ideas into it. Right now the labels are evolving to be a bit more geeky and help people discern how we brew. They keep the same information about the coffees but we have been thinking about ways to help our customers take home the experience they have at the brew bar. 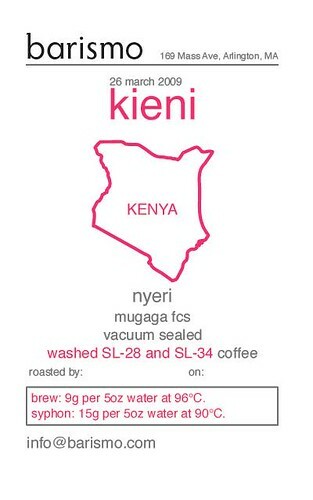 New labels are going to strive to keep our transparent style but add brew specific notes for each coffee. BREW settings are for traditional cupping and french press style brews. The additional notes are specific to our catalog of brew equipment so take the time to calibrate with our website notes as we update them for each coffee. Disclaimer: Methods are specific to our roast style and the brewers we carry. We advise the end user to not expect similar results from different roast style coffees using these methods or the same results using different brewers. Larger Syphons with different form factors and traditional drip roasts may need to be tuned significantly differently to which we advise you to talk to the roaster for their approach. Our pour over brew specs will not translate directly to chemex or aeropress so we advise consumers using those methods to not adopt the pour over suggestions on our bags for these methods. *Printed instructional brew guides are available on request with any purchase.